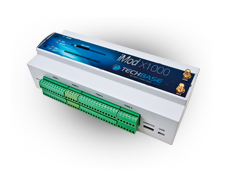 iMod X1000 - modern, ready-to-use platform for automation systems. Proper selection of hardware resources and ready to use software packages enable you to adjust the functionalities of the device according to the requirements of your installation. The iMod platform combines ease of use characteristic of simple devices with possibilities of an embedded computer. With ready to use solutions, you will significantly reduce the time necessary to launch your installation. The installations based on the iMod X1000 are currently running in many countries around the world. See where our devices operate. Due to constant development of applications and the possibility of remote update, you can update software and constantly increase the scope of functions of your device. iModCloud - a cloud service - allows you to visualize and control parameters of any number of devices via a web browser. With iModCloud you can control all your facilities via any mobile device, register data and share selected information with other users. One of the main advantages of the iMod platform is its ease of use and variety of available functionalities. Due to the available SDK, the platform can be extended with new dedicated functionalities. The iMod platform guarantees a quick start and full use of the NPE computer, without the need to write complicated software. It is a fully configurable system, that represents the typical C-L-V usage. Functionality of a protocol and interface converter (Convert) collecting data from input interfaces (e.g. Ethernet or USB), converting and transferring to output interfaces, ZigBee, GPRS or to external modules. All the protocols supported by the iMod computer (M-Bus, Modbus, 1-Wire, TCP/IP, SNMP) can be used both as a source and target of conversion. Functionality of a data logger (Log)The iMod industrial computer can read data from connected devices at high speed. The data can be saved on the device (to internal Flash memory or SD/MMC card) or can be transferred asynchronously to external data bases (PostgreSQL or SQLite). All the archived data can be shared via external or internal systems (e.g. SCADA). Functionality of access via Websites (Visualize) Graphic Visualization, via Web browser, in order to read and control processed data and alarm statuses - you can use a built-in Apache server and an innovative Web platform - NX Dynamics. In addition, due to the possibilities of the Linux operating system, each user can create their own protocols with the use of the available SDK. Embedded Web Server Your can visualize and control parameters via a web browser directly from the device The web-based graphical user interface - NX Dynamics - simplifies the control of the device and allows you to create advanced visualizations. The design of the iMod X1000 allows for trouble-free operation in industrial conditions. It has a fanless case and is characterised by high resistance to external conditions and high reliability. The Linux system provides stable operation of the device. iMod X1000 is a multichannel telemetry module, providing constant uninterrupted access to data. It enables you to save the results of measurements and parameter values of connected devices - data can be saved to internal memory or to an SD/MMC card. You can also save data to internal and external databases. iMod X1000 can generate alarm signals and provide information on current parameter values. Built-in GPRS/3G modem enables wireless communication. iMod X1000 can operate as a typical PLC. The telemetry module can be programmed in ladder logic, which is easy to configure and allows for a quick start of an installation..
Due to the Linux operating system - iMod X1000 is a stable central unit of an automation system. With a built-in GSM modem, iMod X1000 offers advanced functions and can be configured as an industrial modem and a router operating in GPRS, EDGE network as well as in 3G mobile network. You can easily get a backup connection mode and define routing. You can build a VPN with iMod X1000. You can access other devices with one telemetry module with a defined public IP. The VPN guarantees high security of data transmission. 3G technology provides higher speed and lower latency at packet data transmission. 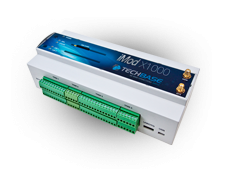 Due to digital I/O and analog inputs, iMod X1000 can successfully replace expansion modules. transfer values via any user protocol (e.g. Modbus, SNMP). With a built-in GSM modem, the iMod X1000 industrial computer can operate as a notify module: it can send alerts when defined parameter values are exceeded (e.g. temperature, humidity). You can easily and quickly configure the content of a message which is send instantly when the value is exceeded. System supervisor will immediately receive SMS or e-mail notification. A GPS receiver allows to use the satellite navigation system. The system is widely used in vehicle monitoring (e.g. transport, railway industry or municipal communication). It allows to synchronize time in extensive industrial networks. It is also used to set a route for industrial machines. Based on a tried and tested NPE hardware platform with Linux operating system. Economic 1-Wire bus support (mainly used for reading temperature sensors). Hardware version with client logo on request (OEM version). You just need to define a proper configuration in order to use iMod X1000. Free documentation and Java based iMod SDK tools enable you to support your own selected protocol and functionalities. Possibility to scan (automatic configuration) devices/sensors via 1-Wire and M-Bus. Data is buffered and instantly accessible (e.g. for SCADA systems). Possibility to operate with external expansion modules in order to increase the number of available interfaces. Possibility to join the TECHBASE Solution Partner program. memory enable long and trouble free operation. No moving parts (fans, disc drives). NX Dynamics – Web-based Graphical User Interface. Enables you to build your own modules (e.g. for process visualization). HMI– due to a range of communication interfaces and built-in protocols, you can connect any HMI panel and manage the installation locally. WWW – the device has a built-in web server, data base and PHP language support. You can easily create and share a dedicated website with view and control functions of selected parameters of the device. iMod operates on the NPE hardware platform with Linux operating system. Linux provides a wide range of programming tools, e.g. C, C++, Java support, tools for data bases support, SSH, SSL and VPN. There is also a possibility to add additional protocols. We have prepared an SDK (Software Development Kit) - a set of tools for adding new functionalities and mechanisms in “plug-in” system. It enables the advanced system integrators to adjust the platform to their solutions. Apart from the channels defining the communication structure of the iMod device, there are other configuration elements, such as: parameters, events, messages. Message template send to predefined recipients. You can also insert MACROS in the messages, which will be dynamically filled when the message is sent. After defining sources, ways of access and message channels you need to define parameters. Each parameter has an alphanumeric, unique ID for creating an internal array of parameters. Apart from the ID, you need to provide the information on the defined source-channel, where the parameter will retrieve its value. You can also add a proper access-channel, if you want to share the values. You can easily view and share data. You can also add a mechanism for event-triggered actions, e.g. sending email. You assign message channels and predefined message templates. 8 x AI DC 0...20 mA (0...7V) (12bit resolution).